For many Caribbean islanders, carnival enthusiasts (they exist) and Trinidadians, February means one thing and one thing only: bacchanal! That’s right, it’s time to wine (dance), time to fete (party), time to bid an enthusiastic farewell to the flesh. And few places on the planet do it better than Trinidad. Carnival or carne vale, is a well-known pre-Lenten festival. It is the traditional start of the Lenten season (those six weeks leading up to Easter) when many Christians restrict their diets, often giving up meat. Carnival is a last chance to bid farewell to the “flesh” before Lent begins. In the United States, this celebration is known as Mardi Gras in New Orleans, Louisiana. By contrast, Trinidad Carnival (or Trini Carnival) is all out affair that consumes the entire nation. Trinidad Carnival is four days of colorful, spectacular revelry capped off with a street parade, also known as “Pretty Mas”, to end all street parades. When news outlets began chronicling carnival around the world last week, I was disappointed when I realized Trinidad was somehow left out. 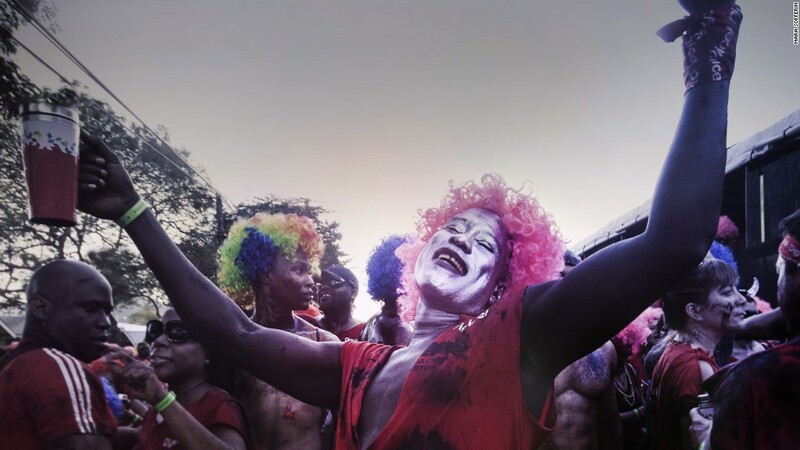 Redemption came last Monday evening with a stunning photoessay, courtesy of CNN and Mara Sofferin, chronicling one notable aspect of Trini Carnival: J’Ouvert. J’Ouvert crowd in Port of Spain, Trinidad. Credit: CNN/Sofferin. This photoessay was almost everything I could’ve hoped for. First of all, given the absolute visual beauty of Trini Carnival, most photojournalists may have opted to tell a story about ‘Pretty ‘Mas”–the Tuesday afternoon parade that caps off four days of non-stop partying. Sofferin picked J’Ouvert. J’Ouvert is French for “to open” and J’ouvert’s daybreak celebrations traditionally “open” carnival. The party starts around 2AM and doesn’t stop until well after the sun rises. Each of Sofferin’s pictures captures some aspect of the sheer exhilaration of a J’Ouvert celebration. J’Ouvert is a time to party (in the street) and to let loose (with paint, mud and chocolate). It is a time when race, age, creed or any other artificial boundary disappears. The following pictures are a good representation of this aspect of Carnival. Jenna, a graduate student from Berlin. Credit: CNN/Sofferin. Children having fun in Kiddie Carnival. Credit: CNN/Sofferin. Bridal party celebration. Credit: CNN/Sofferin. J’Ouvert festivities traditionally start well before daybreak and revelers usually have no idea what they look like until the sunrises. Some of Sofferin’s shots capture this beautifully. Covered in liquid chocolate. Credit: CNN/Sofferin. Steel bands leading the crowds. Credit: CNN/Sofferin. To be fair, I don’t think Sofferin’s shots represent the BEST shots taken during Trini Carnival. That honor goes to Janine Mendes-Franco of Global Voices. Carnival is a brash, exciting time, full of color and any shots taken at daybreak are certain to miss this element. However, the reason I chose this particular piece is because it told the best story through pictures. As for social media, I am okay with the fact that there was little engagement on social media.CNN Travel posted to Facebook–ten people “liked” it. Those are abysmal statistics. Despite it’s relatively poor performance on social media, it is journalism because it told a story. Isn’t that the heart of journalism–storytelling? There was reporting, there were pictures, there was a story. David and Melanie. Credit: CNN/Sofferin.